Situated next to the Fig Tree Bay Cyprus, the Capo Bay Hotel offers a world of luxuries and fun-filled activities to its guests. With a blend of modern features and traditional excellence in service, this hotel is the most recommended place to relax, unwind and rejuvenate in the area. 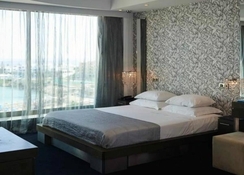 In fact, Capo Bay Hotel is one of the few hotels across the world that consistently gets high ratings from its guests. This beach hotel in Protaras accentuates an aura of serenity with beautiful gardens, fish ponds and the first-rated Blue Flag Fig Tree Bay in Protaras. 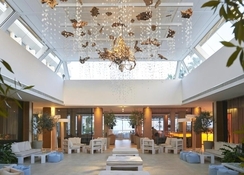 This hotel also comprises of Oneiro Spa center, which is considered to be one of the best spa’s in Protaras. The Capo Bay Hotel is ideally situated in the heart of Protaras and a few steps away from the prize-winning Fig Tree Bay in Cyprus, which is one of the top 10 beaches in Europe. There are many magnificent sites near Protaras, like the famous Profitis Elias Church that’s situated on the top of a hill overlooking the hotel. This place offers a bird-eye view of the whole of the town and the Mediterranean Sea. The Thalassa museum is just 13km from the hotel and you can also visit the ancient monastery set in the centre of Ayia Napa, which is within 13km. 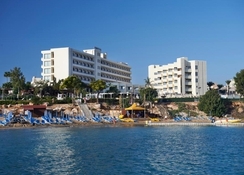 This is the only hotel in the area, which enjoys a stunning view of the Fig Tree Bay. There is a range of bars, restaurants, cafes and discos located near the hotel. The Larnaca International Airport is only 60km away from the hotel. 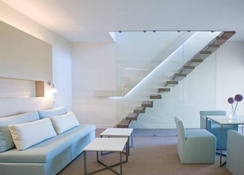 The hotel features 225 elegantly designed air conditioned rooms with attached bathrooms. Every room has a balcony, where you can enjoy the stunning views of the resort, the sea and the gorgeous gardens surrounding the Capo Bay hotel. 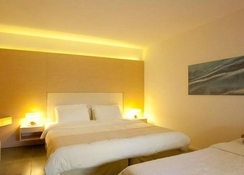 Rooms are categorized as Twin Inland View, Twin Side Sea View, Twin Sea View, Triple Sea View, Family Sea View Interconnecting Room, Deluxe Sea View, Family Inland View Interconnecting Room, Quad Family, Accessible Sea View, Junior Suite, Duplex Suite and Executive Suite. All the rooms have air conditioning and heating. The bathrooms are modern and you can also find a flat screen TV, mini bar and all the necessary amenities too. The Capo Bay Hotel has put in a tremendous effort with its restaurants and bars by offering a wide array of cuisines ranging from local to European and Asian dishes. Whether you want a casual meal or a classy dining experience, the restaurants in this hotel will certainly satisfy your appetite. 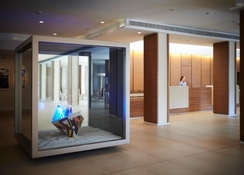 The hotel offers a Dine Around concept to its guests. The Half Board Dine Around comprises of buffet breakfast and one meal, which can be lunch or dinner, while the Full Board Dine Around comprises of buffet breakfast, lunch and dinner. The guests have the choice to dine in any of the hotel’s restaurants that include Elea, Cucina Italian Restaurant, Koi Restaurant and Bar and Dinner 4 2. The hotel offers amazing watersports facilities for diving, swimming and scuba diving in the alluring waters next to the national park Cape Greko – where guests can also embark on a walking and cycling experience amid the naturally beautiful landscape. If you feel energetic, you can work out in the gym or go swimming in one of the two swimming pools before you relax in the evening in one of Capo Bay’s restaurants and bars. There are plenty of sports facilities too in this hotel, including a tennis court. Entertainment is also provided to the guests in the evening, so that you can sit back and relax after a tiring day by the pool! The hotel accepts Debit and Credit card payments.